Well it’s been an awfully long time since I was a match fisherman and an even longer since I picked up a trophy for my efforts. In fact the mantelpiece has hardly been overburdened with silverware despite me turning out for my local Englefield Green AA as junior in the late sixties, for the Uxbridge Rovers Angling Times Winter League Team in the late seventies and then for Thatcham AA in the Reading and District association matches on the Kennet in the eighties. Spending 25 years in politics probably curtailed any matchfishing career I may have had and up to now the only individual trophies needing polishing are the Berrett Junior cup, actually more an egg cup as the club was a bit mean when it came to its’ juniors, and a Kennet Championship trophy from 1988 which also came with a cool £450. This was in the days before cormorants, canal openings and signal crayfish when Berkshire’s finest river was full of fish and over 300 anglers would regularly fish the monthly association matches. In recent years there has been the odd charity outing in support of good causes but my fellow competitors had little to fear from me. However, on Saturday everything changed and a brand new prize now sits proudly over the fireplace. 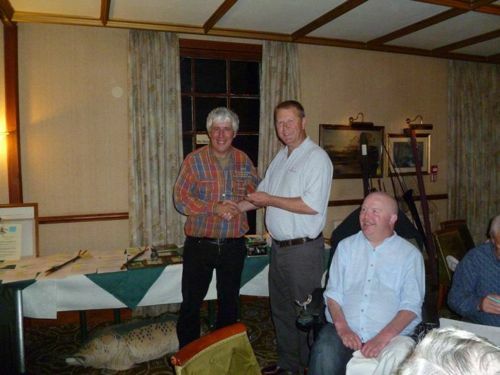 The Avon Roach Project annual fundraising match, held in conjunction with the Barbel Society on the middle reaches of the once famous Hampshire Avon, is more than just another good cause. It is a declaration of support for the wonderful work of Trevor Harrop and Budgie Price whose sterling efforts seek to return those beautiful roach to the middle reaches of the river where once they fulfilled countless anglers’ dreams. The Avon roach were the biggest and best in Britain and have swum these waters since the Ice Age. As the cormorant population exploded out of control in the nineties, so the roach declined to the point where the EA stock surveys showed the middle Avon all but devoid of silver fish. The Angling Trust has put the inspirational work of the Avon Roach Project at the front and centre of our Action on Cormorants campaign and you can find out more at www.avonroachproject.co.uk or AT Action on Cormorants, but you absolutely have to watch the brilliant campaign video made by Hugh Miles below. The Avon Roach Project match is like no other. There is no draw and no weigh-in and the trophy goes to the best fish caught on the day in the opinion of Trev and Budgie. You can fish where you like and how you like as long as you finish in time to attend the meal and auction at the Avon Tyrrell Ford hotel in the evening. Over 60 anglers from far and wide turned out last Saturday, not for the fishing as the Avon was in roaring flood, but to raise money and give support and thanks to the guys for all they are doing for the river and its environment. Over £5000 was raised and a good time was had by all. My one solitary winning barbel of 7lbs 11ozs was a triumph of persistence rather than any great feat of angling skill. I selected a bend downstream of the beautiful Ellingham Bridge that I had not seen for 20 years but where barbel used to lie. As the river rose throughout the day the slacker water on the inside at least allowed me to hold a bait on the edge of the flow for ten minutes at a time before a raft of weed tried to tow the tackle out to sea – in most other spots it was nearer ten seconds. By mid afternoon many anglers where wandering the banks trying to find somewhere to escape the dreaded floating weed and I could see nowhere better than my current position so decided to stay put. Having winkled out a couple of dace too small even for the cormorants and tried every trick I know to tempt a chub, which were apparently few and far between in the coloured water, the best option seemed to be to sit it out for a barbel. With an hour to go the tip crashed round and the bait runner screeched as the only barbel caught that day picked up my hair rigged double pellet and did its dogged dance. Obligingly my new best friend avoided the strong current further out in the river and after a spirited but unsuccessful struggle under the rod tip was soon in the net. A poor day suddenly became a good day and the Angling Trust ‘team of one’ could claim a good day at the office.